Media captionJoanne Dorrian says her sister's disappearance ruined the family's lives. Police are using new technology to try to find the body of a County Down woman who went missing in 2005, the detective leading the investigation has said. 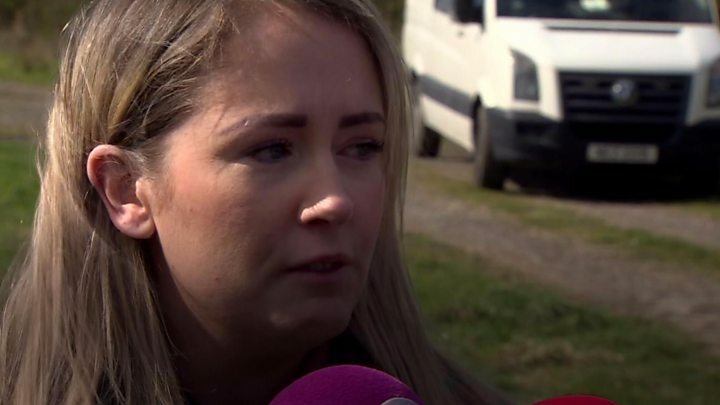 Det Supt Jason Murphy was speaking on the second day of a search beside the caravan park in Ballyhalbert where Lisa Dorrian was last seen alive. Police believe Miss Dorrian, who was 25, was murdered. Det Supt Murphy said the determination of the PSNI to bring those who killed Lisa to justice was as strong as ever. "The purpose of the search operation is two-fold: Firstly I want to recover Lisa's body and allow the Dorrian family to finally put Lisa to rest," he said. "And secondly I am looking for evidence relating to her disappearance. Searches are also taking place at a number of other locations. "Lisa's family has also visited the scene of the search today to appeal to anyone with information to come forward." Det Supt Murphy said police had received new information, but he did not want to discuss what this was. He said the new searches were also taking place after months of planning involving the PSNI and National Crime Agency. Ms Dorrian's sister Joanne said what had happened to her sister had ruined the family's lives. "People can't imagine what this feels like, they can't imagine what it feels like not knowing where she is," she said. "My mum passed away a few years ago and she never got the answers that she needed. It has ruined her life and it has ruined our lives, none of us have been the same ever since this has happened." She added: "To think that Lisa could be here where we are today, it's just so hard to imagine. We're grateful for everything the police are doing to find Lisa and to give her what she deserves." Det Supt Murphy said there was nothing to suggest that Ms Dorrian's murder had been pre-planned, nor that the disposal of her body had been pre-planned. As a result, he said police believed her body was still in Ballyhalbert. The search also includes a disused airfield behind the caravan park, and will take in a number of other areas. "The technology and the thinking has simply developed. What we're able to do in 2019 simply wasn't able to be done in 2005," Det Supt Murphy said. "The searches I'm looking to conduct over the next few days on this site specifically relate to voids under the ground. "As a result of this being a disused airfield from 1945 there may be voids under the ground into which Lisa's body may have been deposited which couldn't previously be found because the technology simply didn't exist." Police have pursued more than 3,500 lines of inquiry and carried out almost 400 searches as part o the investigation. A fresh appeal for information about her murder was made on the BBC's Crimewatch programme last year.